The Airedale Terrier is the largest of the terrier breeds. It was bred in the Aire Valley, in Yorkshire, England, from 1810 until the 1870s. The Otter hound was crossed with the now extinct Old English Black and Tan Terrier. This produced an intelligent all-round working dog, capable of hunting with the miners of the day and guarding the women and children when the men were at work. The Average lifespan of an Airedale is 14 years, and with good care and nutrition can live up to 16 years of age. The ideal height for an Airedale female is 55cm to 58cm, and it weighs from 20kg to 23kg while the male is normally 58cm to 61cm and weighs up to 28kg. This is linked to the dog's development. They are an all-rounder, possessed of sound temperament, great intelligence, and an instinctive desire to protect their family from any perceived danger. Airedales were used in World War I to carry messages through enemy lines and as police dogs and guard dogs. In other parts of the world they are used for hunting and retrieving. The Airedale’s primary purpose is as a companion and family dog. An Airedale Terrier puppy will happily settle in with other pets such as cats, rabbits and other similar animals. This bonding does not extend to pets outside the family home. It is recommended that when two animals are kept they be of opposite sexes. This may prevent any problems of dominance on maturity. 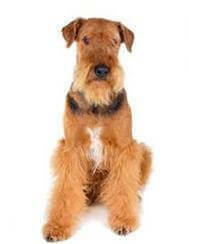 Airedale Terriers have a hardy, wiry outer coat and a shorter undercoat of soft hair. This coat protects them from becoming chilled when wet. The hard hair also protects the dog from seeds or burrs. A good brush and comb once a week will keep the coat in good condition. Use a hard bristle or wire brush and a metal wide-toothed comb. Pets are normally clipped two or three times a year. The Airedale does not shed hair continuously, but will after the winter need thorough brushing to remove the thick dead hair. Do not let your dog become infested with fleas and check for ticks regularly if they are in your area. The Airedale is an active energetic dog and needs regular exercise and play, including training. They are equally at home in a suburban back yard or a large property. Boredom may result in the animal digging holes or the removal of washing from the line and a garden hose lying around will provide much fun for a young dog. He is an excellent family dog, particularly good with children and always ready to join in their games. Not aggressive by nature but protective of his family. b) Commitment and time to exercise and train the dog? c) The ability and desire to provide your dog with the human companionship it needs throughout its entire life?